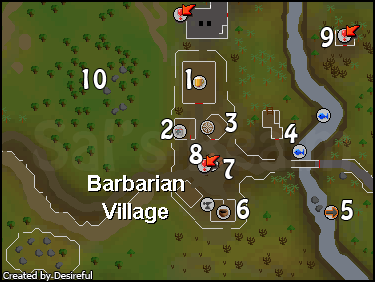 The Barbarian Village is actually a small village, where you can attack Barbarians for Combat experience. Many people come here to kill Gunthor the Brave, a fierce Barbarian warrior who is level 29. 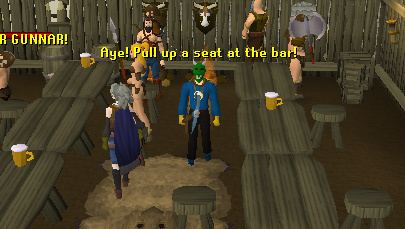 There are no quests that start here, but there is an Activity called the Stronghold of Security where you can learn some important details about account security, and obtain a number of rewards such as a pair of Fancy Boots or Fighting Boots, as well as new emotes such as the "Stamp", "Slap Head", "Idea" and "Flap". Right here at the Longhall you can pick up a nice frothy glass of beer or a a piece of Cooked Meat from the table. There is some Barbarians in the longhall that are ideal for training on. They are also very good for Rangers/Mages because you can stand behind the tables without getting hurt. 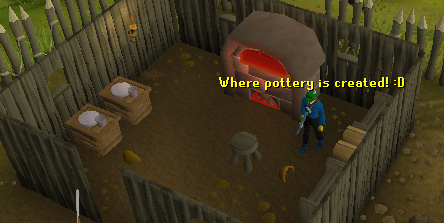 There is also an everlasting fire in this room, this can be helpful to cook food on if you fish from the fishing spot in Barbarian Village. The only shop in the Barbarian Village is the Helmet Shop, which is owned by Peksa. He sells helmets from Bronze through Adamant in Medium and Full sizes! One of the two Crafting tools in the Barbarian Village is the Spinning Wheel! You can spin wool, flax, sinew, and magic tree roots here! Also inside of this house is a Bronze pickaxe spawn on the table which you can pick up to mine the rocks! By the river of this village are two fishing spots. At the fishing spots you can Bait Fish or Fly Fish with a Fishing Rod or a Fly Fishing Rod. You can powerfish here to get quick experience, and there are plenty of trees to start a fire for cooking them (or use an everlasting fire found in the village). 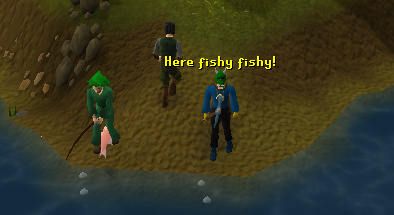 You can even sell them to Player Killers who need food (not many people will want to buy these types of fish, since Lobsters are much better). On the other side of the bridge, to the south, is a Canoe Station. 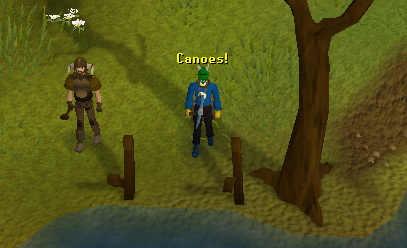 You can chop down the Canoe Station with any hatchet, but you need a certain Woodcutting level for each of the 4 canoes. In a small house in the south-east of town is a Pottery Oven. To work the Pottery Oven, you need an Unfired Bowl, Pot and so on. To make Unfired items, you must have Soft Clay with you. Soft Clay can be redeemed by using a bucket of water (or jug) on Clay. There is also Tassie Slipcast in here. During the One Small Favour quest, you will have to help her. This is the only mine in the Barbarian Village. The mine consists of four coal rocks, and 5 Tin rocks. 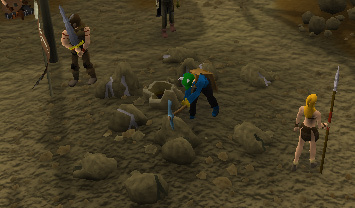 Many people here do not go to bank their ore, so they may drop it, or hire runners. You can grab a Bronze Pickaxe in the north-eastern house. If you are a low leveled miner, then you should mine the Tin ore here, and drop them. Near the north-western corner of this city is a hole, which you can climb down to enter the Stronghold of Security. The Stronghold of Security consists of 4 Levels, which are all mazes. as you proceed through the levels, the monster levels will raise. To the north-east of the river is a room. You will need a Brass Key to enter into the room. If you have a Brass Key, you can go in. 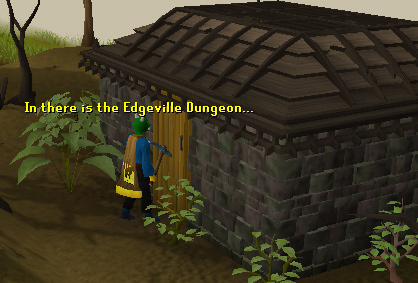 The main attraction to this house is the Edgeville Dungeon. 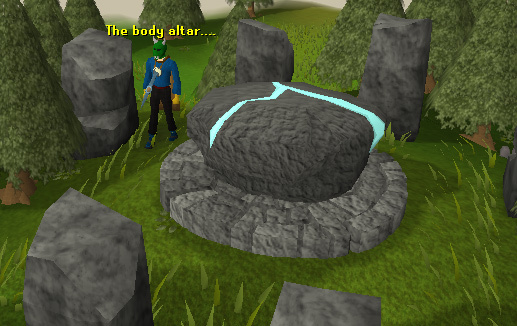 Ahh, the Body Rune Altar. You can craft Body Runes here if you have a Body Talisman or Tiara and some Rune Essence. 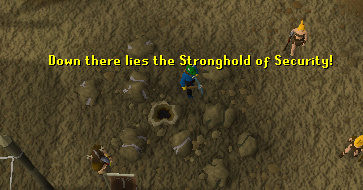 You need 20 Runecrafting to make them. Body Runes are used for curse spells.